How does Sir John Barbirolli stack up with others? Seems like I grew up with much of Barbirolli. Of course, he recorded prolifically, especially for PYE and EMI, and his name still "holds a lot of water" amongst music fans. While I have much of his output on both LP and CD, I have always been interested in his work with the New York Philharmonic and any of his live recordings. A couple of two-CD sets have come my way from the Barbirolli Society in England, and I have quite a few others. It appears these may be released by Dutton under the SJB Society name since the numerical sequence seems to follow the Dutton catalogue number series. Of course, the primary reason for me wanting this set was the inclusion of Gina Bachauer who never recorded enough for yours truly. Then there's cellist Parisot, also an outstanding artist. Well, Clifford Curzon, of course, is one of the very great ones in this repertoire. I haven't had a chance to hear too much else yet on this set. Needless-to-say, Barbirolli's work with the Hallé has been long going and was was highly respected for his work with this ensemble. I've listened to some of Barbirolli's New York Philharmonic performances at the performing arts library, and they are much better than Virgil Thomson's relentless opposition might lead one to expect. From what I've read, the musicians loved him, not just because he was temperamentally the opposite of Toscanini and collaborated with them instead of ruling them, and by and large they played well for him. That said, his interpretations don't have much profile, understandably since he was very young and learning most of the music for the first time. He was a superb concerto accompanist; his 1930s EMI recordings with Kreisler made the violinist an advocate for him with the NY Philharmonic. Some of the recordings of his maturity in the 1950s and 1960s I like very much, and not just in the repertoire you might expect - Elgar et al. His Dvorak 8th, recorded with the Hallé Orchestra by Mercury in their famous Living Presence sound, is still a favorite. Barbirolli was one of the early experimenters with Mahler, and his live recordings issued on the BBC label are mixed. However, his Vaughan-Williams issued by EMI is excellent, as is an electric Nielsen IV. His Mahler VI, while it starts out too slowly, is very fine, also on EMI. His Sibelius is generally very good as well. 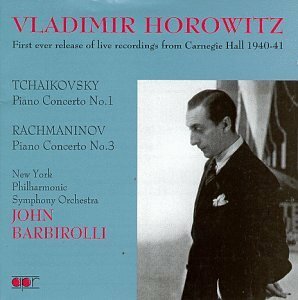 I also have an interesting (some might say odd) disc of Barbirolli in NY with Horowitz playing Rachmaninoff III and Tchaikovsky I. The tempo is not steady at all from one musical idea to the next, so it makes for interesting study even though I don't agree with the results. Unlike Beecham, whose clash with Horowitz over Tchaikovsky 1 at the Philharmonic carried over into the performance, Barbirolli was adaptable to his soloists' concerto interpretations, as befits one who had begun his conducting career in opera. However, he was still inexperienced in the concert repertoire when he took over the New York Philharmonic at 37, having previously led the Scottish Orchestra for only 3 seasons. Willful soloists like Horowitz and Josef Hofmann could throw any conductor off - even Artur Rodzinski couldn't always handle Hofmann. Different times. Well, when the short-lived Classic CD magazine published its "100 Greatest Conductors of the Century" in '99, the all-Brit critics put Barbirolli in, something like, the top three. "Glorious John" was always his moniker over there, and his entry concluded how they miss him still. He was hugely hailed for the "emotional" qualities of his performances. To me, he's more or less another Brit, just like Colin Davis (who was, I recall, #2): very civilized, well-thought-out, logical interpretations....but definitely no Beecham (only #5?). It's strange how time changes perceptions. Among the younger set [25 and younger], they don't even recognize the names of Toscanini or Furtwängler any longer, and Klemperer, who's he? And the most who recall the name Beecham are passing away at a fast pace. For me, of course, Beecham does fall into the higher echelon of the great ones. I guess it all depends upon what "age" you are and to whom you have been exposed to either live or on recordings the most. Wallingford wrote: Well, when the short-lived Classic CD magazine published its "100 Greatest Conductors of the Century" in '99, the all-Brit critics put Barbirolli in, something like, the top three. "Glorious John" was always his moniker over there, and his entry concluded how they miss him still. He was hugely hailed for the "emotional" qualities of his performances. Beecham has fallen so far from grace that there hasn't been even a rumour about a big box set! Somebody with Warner should do that. I can't think of a more consistently great conductor (except perhaps Toscanini.). Certainly Beecham had his own style, and some of the recordings are dated, but his approach was always deeply satisfying to yours truly. maestrob wrote: Beecham has fallen so far from grace that there hasn't been even a rumour about a big box set! Somebody with Warner should do that. I can't think of a more consistently great conductor (except perhaps Toscanini.). Certainly Beecham had his own style, and some of the recordings are dated, but his approach was always deeply satisfying to yours truly. Good point, it is curious. All sorts of people are being honoured in this way, many of far lesser musical stature. A truly complete Beecham box, or even one limited to his EMI recordings, would be enormous, considering all the operas, oratorios, and duplications of repertoire. Maybe EMI is working on it; maybe not, if they don't think they can sell it. Sir John was a delightful man. I saw him conduct on a few occasions and he always was excellent. I even got the chance to interview him for my college paper. His recordings of Elgar are as definitive as you can get. He loved the two great Elgar Symphonies and his recordings show his greatness. Never heard that, and it doesn't fit anyway. Beecham's father made his fortune in pharmaceuticals, not chewing gum. His company, now a major component of GlaxoSmithKline, is still the brand name in the UK for over-the-counter cold and flu remedies. 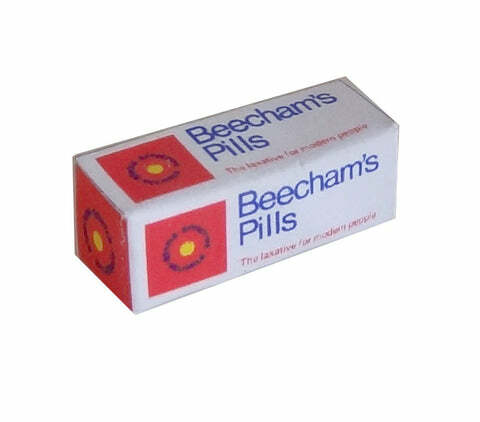 Beecham's pills are just the thing. Two for man and one for child. I did a double-take on that photo thinking it might be Volume 1 of a complete Beecham series issued by Warner Classics! John F wrote: Never heard that, and it doesn't fit anyway. Beecham's father made his fortune in pharmaceuticals, not chewing gum. His company, now a major component of GlaxoSmithKline, is still the brand name in the UK for over-the-counter cold and flu remedies. Barbirolli conducted the Houston Symphony from 1961-67, a good friend of mine [now deceased] played for him there. The musicians loved him. Barbirolli was son of an Italian father and French mother, tho he was born in England and considered himself to be cockney all the way. One of the funniest Barbirolli stories pertains to his WWI experience, when he served with the British Army...his platoon sergeant was a big, burly Irishman, loud, gruff, forceful. He immediately took to Sir John, glad to have a fellow Irishman in the unit [ ] "Bob O'Reilly"
This sergeant always called him Bob O'Reilly, as in "O'Reilly - hop to it", "O'Reilly, front and Center" "O'Reilly, over here on the double", "I need a volunteer, you, O'Reiily...", etc, etc. My first Barbirolli recording, a superb 1967 Eroica, recommended by Stereo Review, made me an admirer of Sir.John. Several years later, I bought his unsurpassed 1962 Tallis Fantasia (a desert island choice if there ever was one). It confirmed for me that he was a truly great conductor. This Dec. 19, 1999 article from The ChicagoTribune details why others have had the same opinion of "Glorious John." By Alan G. Artner, Tribune Staff Writer. Thirty-five years ago, when giants of the symphonic podium had just begun to disappear, critic-musicologist Deryck Cooke wrote of John Barbirolli: "He is one of the few remaining conductors who puts not only his head and technique into his performances, but his whole heart and soul." That assessment reappeared as part of a Barbirolli memorial in 1970, and it comes to mind now, in the month of the centennial of his birth (Dec. 2), because the Barbirolli recordings that have reappeared on compact disc give ample evidence of its truth. No matter whether one likes his unreserved approach to making music, there's no denying it is in audibly short supply on contemporary recordings of the same repertory. In 1964 Barbirolli said in Musical America magazine, "I've done my share of contemporary music, and now I feel it's my duty to perform only the best music, the music I really love." In the 30 years since he had assumed the directorship of the Philharmonic-Symphony Society of New York, the most common observation -- and the one that came up increasingly during his decades back in his native Great Britain -- was that he loved music too much for its own good. No one suggested ill-preparedness, egotistical distortion or playing to listeners who sought cheap thrills; no one would because in a Barbirolli performance you heard the difference. If there was a "problem," it came from an excess of passion, reverence or identification, conditions that might distract from the shape and movement of the whole with bursts of ardor, localized color or lingering caresses. Michael Kennedy ended his 1971 biography of the conductor with a scene in a car. Barbirolli is fatally ill and exhausted after a sleepless night. Nonetheless, he takes a score from his briefcase and starts making annotations. The ride goes on in silence, so Barbirolli might possibly drop off to sleep. When the driver turns to check on him, he is crying and points in the score to a phrase for violas, asking, "Isn't that beautiful?" Throughout the text there are many such scenes of him surrendering to music. However, Kennedy also tells us of how Barbirolli wrote in his notebooks a quotation from Bertrand Russell: "Nothing is achieved without passion, but underneath the passion there should always be that large impersonal survey which sets limits to actions that our passions inspire." Barbirolli's survey of a score would occasionally take as long as two years before he hazarded to perform it; even then, he did not go before the public with Gustav Mahler's Ninth Symphony until after nearly 50 hours of rehearsals. Leopold Stokowski, not an artist overly generous with compliments, once raised a clenched fist and exclaimed, "What power -- Barbirolli, a great conductor!" And perhaps because the subject of that tribute recorded in long takes with minimal patching, the best of Barbirolli's recordings have the power of live performances in addition to superfine tone and balance. Elgar: Sospiri; Elegy; Symphony No. 2. New Philharmonia, Halle orchestras (EMI CDM 7 64724 2). Barbirolli often looked back to pre-World War I London with affection. He played cello in an early performance of the symphony under the composer, and perhaps because Barbirolli was Italian and French by birth he found strong universal emotions where British colleagues saw mainly reticence. The climax to the elegiac second movement is intense beyond all imagining. Record producer Malcolm Walker recently wrote, "Such string sound you do not hear now." Vaughan Williams: Symphony No. 5; Bax: Tintagel. Philharmonia, London Symphony orchestras (EMI CDM 5 65110 2). Barbirolli conducted the music of Alban Berg in the late 1920s and had in his repertory works by Bartok, Britten, Hindemith, Janacek, Martinu, McCabe and Walton. Still, of all 20th Century composers, none meant more to him than Vaughan Williams, whose Seventh and Eighth symphonies he premiered. Barbirolli recorded 11 of his works, some more than once, and this stereo remake of the Fifth Symphony is the utmost in spiritual concentration and serenity. Mahler: Symphony No. 9. Berlin Philharmonic (EMI CDM 7 63115 2). In the 1960s Barbirolli told an interviewer, "It is a long time since a composer had anything essential to say," and cited Mahler as one who did, despite his continued cool acceptance in England. The same atmosphere prevailed in Berlin in 1964 when, following a series of concerts, the orchestra requested he make this recording. Other Mahler conductors praised his extraordinary conception. William Steinberg wrote: "Altogether, your performance was something against which to measure the rest of one's experience." Sibelius: Symphony No. 2. Royal Philharmonic Orchestra. Chesky 3. Barbirolli recorded this warhorse four times, though only the first and third versions are currently available. The present recording, from 1962, immediately became one of the touchstones for the work, substantiating a comment from conductor Jussi Jalas, the composer's son-in-law: "We Finns ought to be ashamed that it takes a British orchestra and a British conductor to show us how to play Sibelius." Puccini: Madame Butterfly. Renata Scotto, Carlo Bergonzi, Rolando Panerai, Rome Opera House Chorus and Orchestra. EMI CMS7 69654 2. Barbirolli conducted Italian opera since the mid-1920s but had to wait 40 years before making his first large-scale opera recording, in less than promising circumstances. Still, what resulted was one of the freshest, most exquisitely detailed versions on disc and the recording that Barbirolli's biographer Michael Kennedy selected as, measure by measure and phrase by phrase, the most representative of the rapture at the core of his art.